Muchos eran los rumores que iban encaminados a una dirección y parece que era la correcta. PocketWizard ha sacado FlexTT5 y MiniTT1. PocketWizard ControlTL es el nuevo sistema de utilizar flashes remotos de PocketWizard. A través de la zapata del flash de la cámara te envían, vía radio, señales TTL. El PocketWizard MiniTT1 es un pequeño emisor, de bajo perfil, que se desliza en la cámara zapata. El transciver PocketWizard PocketWizard FlexTT5 es también de bajo perfil, pero ligeramente más grande y sirve como emisor y receptor. Ambas soluciones forman el PocketWizard ControlTL, datos TTL que se envían a través de la zapata y se transmite en una señal de radio fiable. Ya no habrá problemas por hacer cambios en el ISO, la apertura y el tiempo de obturación. Incluso se podrá utilizar el control de compensación de flash. Además, la velocidad de sincro se podrá subir a 1/500. 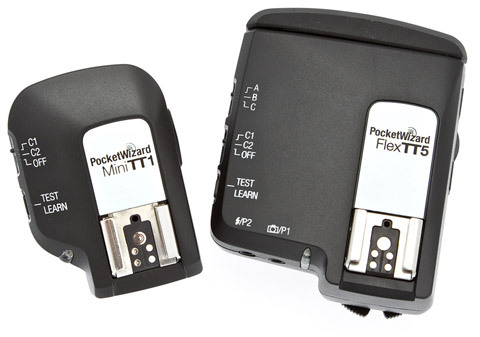 Los PocketWizard FlexTT5 y MiniTT1 estarán disponibles para Canon a partir del 1 de marzo. Los usuarios de Nikon tendrán que esperar un poco más y a partir del segundo cuatrimestre del 2009 lo podrán disfrutar. Los precios, inicialmente sólo disponibles en EE.UU. y Canadá serán de $199 para el MiniTT1 y $219 para el FlexTT5. So. Burlington, VT – February 16, 2009 – Professional photographers have depended on PocketWizard radio slaves for reliable triggering of their manual flashes and cameras for years. With the advent of digital technology, photographers have been seeking a simple solution for off-camera TTL flash without limitations or complexity. PocketWizard has made it possible with the “Slide-n-Shoot” simplicity of the new ControlTL™ system, featuring the MiniTT1™ Transmitter and FlexTT5™ Transceiver for Canon and Nikon. These new E-TTL II and i-TTL capable radio slaves make taking off-camera flash as effortless as slide-in, turn-on and shoot. Now you can get perfect off-camera flash photos in any environment—around corners, out-of-sight and in bright sun. Canon and Nikon users can use the new MiniTT1 Transmitter and FlexTT5 Transceiver to control single or multiple off-camera Canon E-TTLII or Nikon i-TTL flashes at speeds up to 8/fps. The MiniTT1 Transmitter is a tiny, low-profile unit (2.8 x 1.9 x 1.3 inches) that slides into the camera’s hot shoe. The FlexTT5 Transceiver is also low-profile but slightly larger (3.6 x 2.9 x 1.4 in.) transceiver. Both take the complex TTL data being sent through the camera’s hot shoe and digitally transmit it in a reliable radio signal. Photographers can now place TTL (or manual) flash units anywhere to illuminate the scene: behind walls, under tables, on stands – anywhere out of sight. Each flash unit is connected to a dedicated FlexTT5 Transceiver for TTL operation; there are no wires or connecting cables required. Any change in ISO, aperture and shutter speed is automatically adjusted for. Changes in flash exposure compensation on your camera are passed along giving you convenient remote power control of your TTL flash. The new units are compatible with any PocketWizard for triggering manual flash or remote cameras or you can mix your TTL flash with any manual flash if desired. These products are the beginning of a new era in PocketWizard technology featuring the ControlTL firmware. Designed for the latest in digital cameras, ControlTL enables some previously impossible camera capabilities including HyperSync™. HyperSync enables photographers to achieve standard sync speeds up to 1/500 second and not just with TTL flash, but with any flash. Need more speed? Push beyond 1/500th and go into FP/High-Speed sync mode automatically. No buttons to press or settings to change other then your shutter speed will give you flash sync all the way to 1/8000th. Photographers can now use flash with wide-open apertures, outdoors in bright sunlight resulting in some amazing new images. Both units have a two-position channel switch with “Learn” mode that can be programmed either by computer or with another PocketWizard radio. The system works on 20 ControlTL channels or any of PocketWizard’s 32 existing channels for traditional triggering and it works with Canon and Nikon’s A-B-C zone capabilities including ratios. Plug a Mini or Flex unit into a computer with the PocketWizard utility software loaded and you can configure channel and zone settings, HyperSync timing, sleep timers and more or just update the unit’s firmware with the push of a button. The new MiniTT1 and FlexTT5 radios can do all this and more and as digital technology advances, more capabilities will be added to the system, essentially offering “future proof” technology. Versions for Canon are available March 1st, Nikon in 2Q, 2009. US & Canadian markets. Other markets expected to be delivered April 1. Please contact your local distributor for availability. PocketWizard products, including the PlusII, MultiMax, MiniTT1 and FlexTT5 are made by LPA Design, based in South Burlington, Vermont and sold by distributors around the world including the MAC Group in the USA. No se han encontrado post relacionados. Esta entrada fue escrita el 17 de Febrero, 2009 a las 9:08 am en Hardware, Noticias. Puedes seguir los comentarios de la entrada a través del RSS 2.0 feed. Puedes dejar una respuesta, o hacer un trackback desde tu sitio.